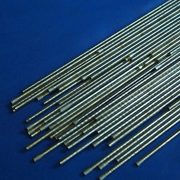 Type 12 bare rod develops high hardness, abrasion resistance and good corrosion resistance. These properties make type 12 the choice for cutting wood saws and bars and for industrial cutting applications for carpet, plastics, paper and chemical industries. It is non-forgeable and can be machined with difficulty using carbide tools. Type 12 bonds well to all weldable grade steels, including stainless.